If you are interested in Traditional Archery, why not take advantage of what Mayo has to offer next time you come to the West of Ireland. As well as MAC (the Mayo Archery Club) you can practice your field archery on a 3D course with your own or rental equipment. If you have never tried archery you can also organise a lesson and if you can't make it to Mayo you can purchase archery equipment at the Flybow shop. Follow the links below for more information on the Mayo Archery club. bear huntA traditional archer uses a bow without sight equipment or any other technology. Flybow's 3D-course has 20 3D targets in a natural area covering 5 hectares. The shots vary in distance, elevation, size of target and cover. 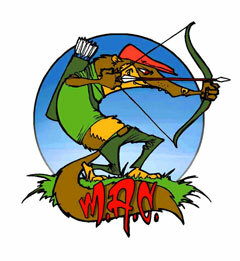 MAC-Mayo Archery Club is revived in 2003 and MAC members hold their own "3D shoot" in Mayo 3 times a year. Members also travel far and wide to participate in other shoots organised by numerous archery clubs throughout Ireland.